alaTest on kerännyt ja analysoinut 29 arvostelut lehdistä ja verkkosivustoilta. The Creative Sound Blaster X7 is a jack-of-all-trades USB amp with that offers unrivaled features and connectivity for the money. Sound quality is up there with dedicated DACs. The volume knob is handy for PC desktop use. Better hi-fi amplifiers can be had for the price. No remote control beyond the smartphone app. Build quality isn't as good as you'd expect for a $400 component. The headphone detection circuit is poor, and hooking up surround sound is a pain. 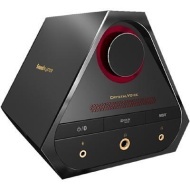 The Creative Sound Blaster X7 offers a ridiculous number of features for the money and sound quality is generally very good, but its appeal is limited. You name it, the X7 can do it: It's a high-end DAC, headphone amp, USB audio device, digital amplifier, recorder, Bluetooth host, and more. Some dodgy software muddies the music, but with tweaking this is a great solution.